Summer is sizzling in Middle Tennessee and the newest Coreopsis are hot, hot, hot! C 'Mercury Rising' is blooming a velvety claret in my garden, some with white tips that I find quite striking. 'Mercury Rising’ is one of the new introductions by Darrell Probst in his ‘Big Bang’ series of hybrid coreopsis. I am crazy about them! Yes, you heard me say I was crazy about Coreopsis hybrids and I am. Of course, my go to plants will almost always be species plants, but, there's plenty of room in my heart and garden for flowers that are attractive to pollinators, whether they are the straight species, a cultivar or a complicated hybrid. I believe that a healthy garden, one that's attractive to pollinators, has a lot of flowers. In fact, my goal this past year has been to plant more flowers. Lots and lots of flowers that bees and other pollinators prefer. Flowers that have a range of shapes and sizes to attract butterflies, bees, hummingbirds and even flies and beetles! Flowers that are early bloomers and are pollinated by gnats and flies or the occasional honeybee out and about on warm days. Flowers that bloom for a long time. 'Mercury Rising' has been a good addition to my pollinator friendly garden. They're never, ever without some pollinator visitor and they bloom for a very long time. I don't know how you feel about this, but, those are very good reasons to include them in a native plant garden! PS. I found Button Bush growing wild beside a pond, so I'll have a Wildflower Wednesday post ti link in next week. Flowers, flowers, flowers...yes! That Coreopsis is beautiful and obviously loved by your pollinators. It looks great next to your blue pot, too. As someone that has a lot of flowers I agree, plant them with abandon. I too have a number of Coreopsis for the reason you mention, they last a long time. With the heat and dry weather, at least they are very happy. Beautiful! I love coreopsis, too. I think it's time I added more to my garden. Beautiful! I remember adding this one to my wish list last year, but still haven't added one here. 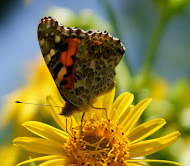 I agree, there are lots of non-native plants that the bees and butterflies love. Zinnias and lantana come to mind, and the hummingbirds absolutely love my 'Black and Blue' salvia. I haven't tried C. 'Mercury Rising' yet but I think your photos are pushing me in that direction. My own C. 'Redshift' have just started to bloom, a welcome sight when so many other flowers are hunkering down in the heat. I too highly recommend C. 'Mercury Rising'! It's a stellar plant. I bought my first one two years ago and just recently I bought two more one gallons for $4.50 each! I know, pinch me! I can't say enough great things about this plant. Hello Gail girl ! ... I have Big Bang "Galaxy" and it is gorgeous ! ... the lavenders I have planted near them are busy all the time with pollinators ... Galaxy is a double soft yellow flower and is so pretty I will be looking for more of them next year for sure. It's hard to go wrong with hot pink. Thanks for introducing me to this hybrid. It will be finding a place in my garden. A very nice new variety. The only Coreopsis I have is C. palmatum. 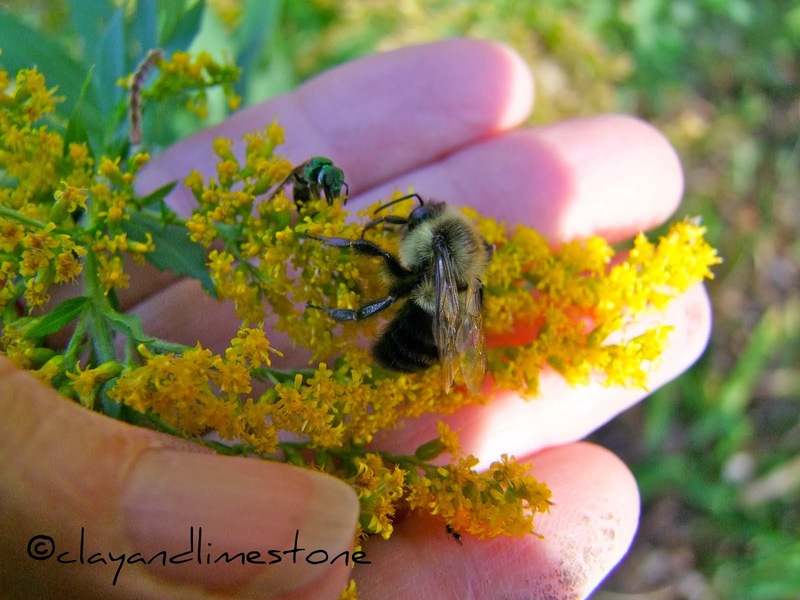 I applaud and share your approach to supporting pollinators. I planted one of these this year too, and it is very charming! However, I haven't sited it very well. It's a little lost amongst all the big show offs near it. Maybe I just need more of it! I love Coreopsis too! They are a great mid-summer flower in New England. And very hardy, which I appreciate. I picked up 'Cosmic Eye' this spring and have been very happy with it. It is the first coreopsis I have had since the disappointing 'Liimerock Ruby' was the it plant everyone had to have that turned out to be an annual. I love the coreopsis hybrids too...I need to rescue a few and give them a better site...this is a beauty!